Fungal endocarditis (FE) is a rare disease, accounting <10% of infective endocarditis (IE). Candida endocarditis is a rare, but frequently fatal infection. Previous surgery, vascular lines, antibiotic use, underlying heart disease, prosthetic valves, and immunocompromising conditions are major risk factors for FE. Previous abdominal surgeries are known to predispose to candida endocarditis. 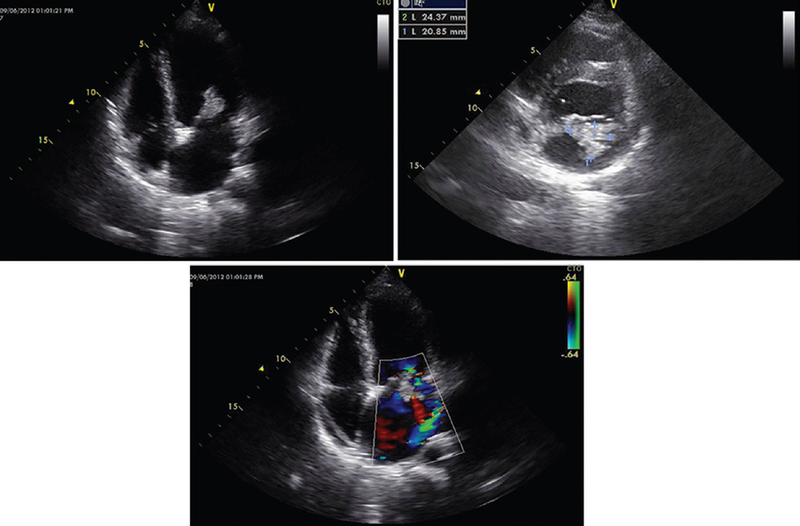 We report on an immunocompetent primigravida at 32 weeks gestation who developed native mitral valve nonalbicans candida endocarditis 2 months following an open appendicectomy. A 28-year-old primigravida at 32 weeks of gestation was admitted with low-grade fever and lower abdominal pain for 2 weeks. She had hypothyroidism and was on thyroxine supplementation for 3 years. She had pregnancy induced hypertension since 5 months of gestation that was treated with labetalol. She also gave a history of an open appendicectomy 2 months back during the third trimester. On examination, she was pale, had purpuric spots in lower palpebral conjunctiva, febrile, tachypneic and tachycardic. Systemic examination did not reveal any abnormalities. Hemoglobin was 10.7 g/dl, total white blood cell count 17,600/μl with predominant neutrophils, platelet count 1.6 × 109/L, erythrocyte sedimentation rate 65 mm in 1 h. urinalysis showed 3+ albuminuria with 4–6 leucocytes/high power fields, numerous red blood cells and no casts. Biochemical parameters revealed ribosome binding site 65 mg%, urea 16 mg/dl, creatinine 0.6 mg/dl, sodium 132 mmol/l, potassium 4.6 mmol/l, aspartate transaminase 53 IU/l, alanine transaminase 23 IU/l, alkaline phosphatase 168 IU/l, total bilirubin 0.8 mg/dl, direct bilirubin 0.1 mg/dl, total protein 5.9 g/dl, albumin 2.3 g/dl, globulin 3.6 g/dl. Ultrasonography abdomen was normal. Urine culture did not grow any pathogens. She was diagnosed to have urinary tract infection and was started on cefotaxime. Her fever continued in spite of antibiotics and tachypnea and tachycardia persisted. Workup for fever including tests for dengue, leptospira, malaria, antinuclear antibody was negative. Echocardiogram showed a pedunculated 24 mm × 21 mm mass attached to the undersurface of anterior mitral leaflet near the tip [Figure 1] and moderate mitral regurgitation. Repeated blood cultures showed growth of yeast like budding cells without pseudohyphae, suggestive of nonalbicans candida. She was immediately started on liposomal amphotericin and was taken up for surgery, but she went into sepsis and multi-organ dysfunction, and despite all efforts she succumbed to her illness. The incidence of IE during pregnancy is low (0.006%) and carries significantly high maternal and fetal mortality rates, most deaths being related to heart failure or an embolic event. Previous abdominal surgery is considered as a risk factor for candida endocarditis. Tonomo et al. reported on a 22-year-old man who developed nonalbicans candida endocarditis 2 years following an abdominal surgery. Nonalbicans candida endocarditis, 8 months following right hemicolectomy was also reported previously. Our patient developed native mitral valve endocarditis 2 months following an open appendicectomy due to nonalbicans candida. She presented with symptoms suggestive of urinary tract infection, and there were no clinical signs suggestive of IE except for the presence of purpuric spots in lower palpebral conjunctiva. The presence of unexplained significant hematuria in a patient with fever also favors IE. The combination of antifungal and surgical therapy is better than antifungal therapy alone. The traditional antifungal amphotericin B, echinocandins, and newer azoles are used for medical therapy. In addition, surgical intervention with valve replacement is generally recommended in most cases. Previous studies show candida IE mortality to be up to 80%., Delay in diagnosis due to various factors increases the mortality rates hence prompt recognition is prudent. Our patient received liposomal amphotericin B and was planned for surgical intervention, before which she succumbed. Our case reminds readers to be aware of FE, when evaluating patients with fever having previous history of abdominal surgery. Ellis M. Fungal endocarditis. J Infect 1997;35:99-103. Pierrotti LC, Baddour LM. Fungal endocarditis, 1995-2000. Chest 2002;122:302-10. Cox SM, Hankins GD, Leveno KJ, Cunningham FG. Bacterial endocarditis. A serious pregnancy complication. J Reprod Med 1988;33:671-4. Tonomo K, Tsujino T, Fujioka Y, Nakao S, Yao H, Yasoshima H, et al. Candida parapsilosis endocarditis that emerged 2 years after abdominal surgery. Heart Vessels 2004;19:149-52. Khan MU, Ali S, Baig MA, Rafiq MA, Vasavada BC, Khan IA. Candida parapsilosis endocarditis 8 months after transient candidemia. Int J Cardiol 2007;118:e58-9. Baddley JW, Benjamin DK Jr, Patel M, Miró J, Athan E, Barsic B, et al. Candida infective endocarditis. Eur J Clin Microbiol Infect Dis 2008;27:519-29. Gardiner BJ, Slavin MA, Korman TM, Stuart RL. Hampered by historical paradigms – echinocandins and the treatment of Candida endocarditis. Mycoses 2014;57:316-9. Lye DC, Hughes A, O'Brien D, Athan E. Candida glabrata prosthetic valve endocarditis treated successfully with fluconazole plus caspofungin without surgery: A case report and literature review. Eur J Clin Microbiol Infect Dis 2005;24:753-5.